Dine Out Vancouver starts on Friday, Jan 20, 2017 this year. Already many restaurants are probably all booked up, but you would like to go to a top quality restaurant. One thing is to think outside of the box; the box in this case being the City of Vancouver. There are many restaurants east of Boundary. One such restaurant that I visited, on behalf of Dine Out Vancouver is Mangia e Scappa in Fort Langley. Before you say, that is too far for me to consider, consider that on the freeway, taking the Port Mann bridge, is a mere 35 minutes from Boundary to Mangia e Scappa. You probably spend at least 35 minutes to go to work every day. At least for this drive, your end result is a nice dinner and a glass of wine! I went to Mangia e Scappa to try some of their appetizers, mains, and desserts, to give me a feel for what kind of food I, and you, can expect for Dine Out Vancouver. Mangia e Scappa is owned by Giulia, a wonderful Italian-descent lady, who opened up this restaurant in September 2015. Connected to the restaurant is a small store where you can buy Italian cheeses, pasta, coffee, cookies and more. The restaurant is designed and decorated very tastefully. 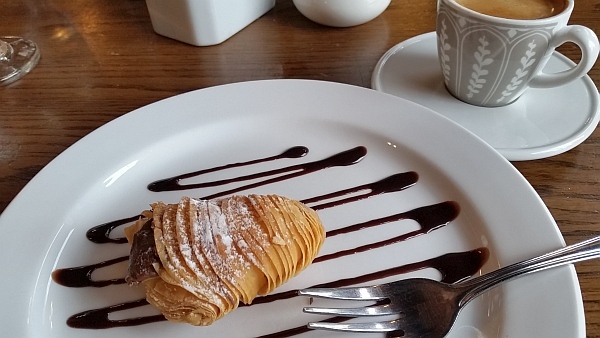 Within the restaurant there is a beautiful coffee bar with copper plate along the front, and a chilled display of their home-made Italian desserts. 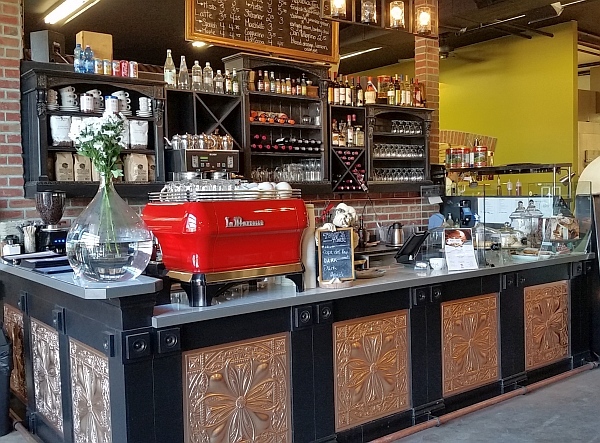 Just to the side and behind the coffee bar is the kitchen where you can see the chef prepare a dish, toss a pizza dough round in the air, or pull a pizza from the wood-fired oven. 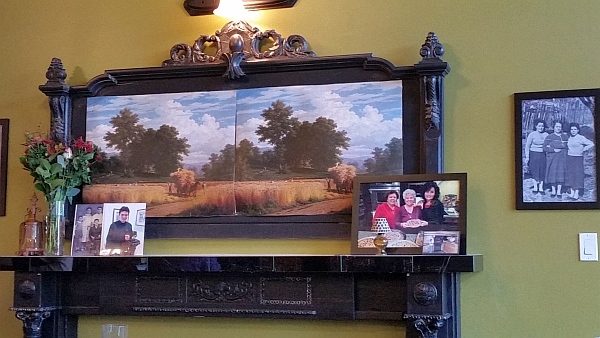 The walls of the restaurant are adorned with paintings, and pictures of Giulia’s family. One of the chefs for the restaurant is Giulia’s son. In the background you will hear Italian music playing, taking you away from our winter weather, and thinking of an Italian summer. 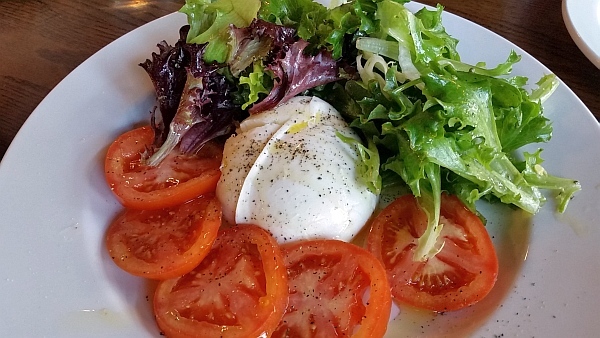 The fresh Caprese Salad was made with a light drizzle of olive oil and black pepper. It was nice to have along with the Calamari Fritti. I do eat a fair amount of calamari, and can tell good calamari; this was done very well. The calamari rings were soft, not chewy, and the batter was crisp and light. 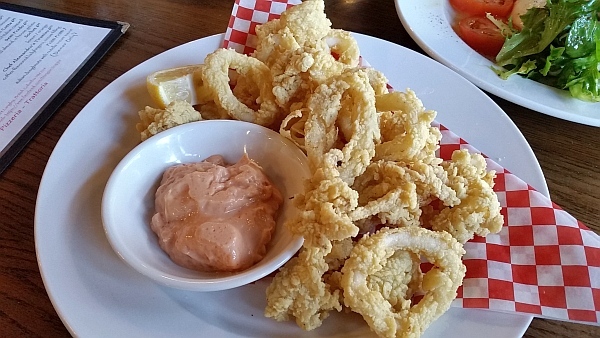 Dip the calamari in the mayo sauce for some extra flavour, or squeeze the lemon wedge that comes with the dish. 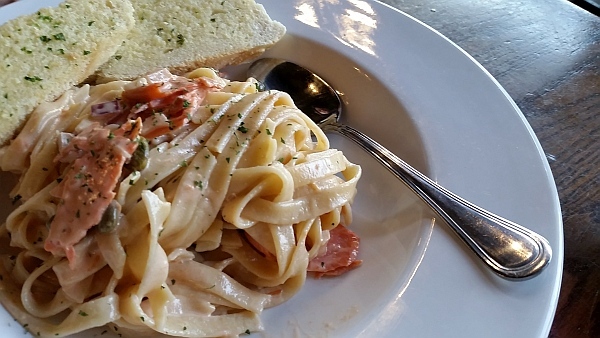 The two main courses, the Penne a la Matriciana and Smoked Salmon Fettuccine were both made very well. The pasta was hand-made using 00 flour imported from Italy and was cooked al dente. If you can take a bit of spice you would enjoy the Penne a la Matriciana. After eating a whole plate, I was still able to have some room for dessert. 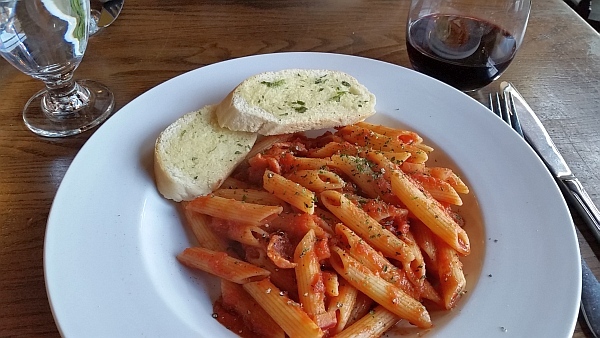 With the Penne, I had a glass of Farnese Fantini Puglia Sangiovese. It was soft and fruity, ripe cherries and vanilla. An easy pairing. The Smoked Salmon was soft and flaky and you had the tart capers and the flavour of the red onion to complement the salmon. The only thing my lunch guest wished, was there was more sauce for the dish. 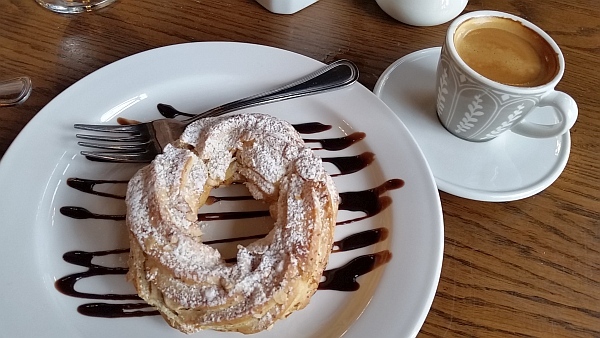 Dessert was a Hazel Crema Nello and a Sfogliatelle with Nutella/Ricotta. I first tried the Hazel Crema Nello which was in a donut shape, slices in half and filled with the hazel nut cream filling. The cream puff pastry was firm but not crumbly and the filling was delicious. Not sweet at all. It went very well with my espresso. I would highly recommend enjoying this dessert many times. The Sfogliatelle was also very good, but the Nutella was a bit too chilled and was hard to cut. It should have been warmed a little to allow it to easily be cut with a fork (at least for me. Maybe that is traditionally how it is served?). Overall everything I had at Mangia e Scappa was top quality, freshly made. For Dine Out, as the menu shows below, there is a variety of dishes for seafood and meat lovers. All the dishes are made especially for Dine Out Vancouver. I like when restaurants make dishes specially for Dine Out, and not repackage existing menu items. Here is the link to Mangia e Scappa’s Dine Out menu menu plus contact details for Dine Out Vancouver. Enjoy!